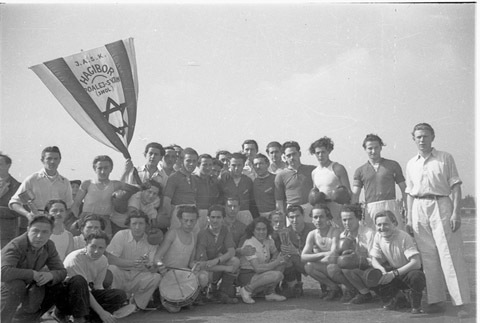 JDC - Archives : A group photo of the Hagibor sports club at the Bergen Belsen DP Camp. Title A group photo of the Hagibor sports club at the Bergen Belsen DP Camp. Description A group photo of the Sport Club "Hagibor" at the Bergen Belsen DP camp. JDC provided sporting equipment to the refugees.